Now in its fourth decade, the Cat's Hill Classic Criterium has become a well-known event throughout the cycling community. The race is a criterium that requires a combination of skill, speed, strength, and stamina: The hill on the Cat's Hill course favors the toughness of the road racer, while the finishing stretch on Tait Avenue favors the raw speed of the sprinter. Thus, the course lends itself to all types of riders, and the circumstances of each event will differ depending on the tactics used by the competitors. The first Cat's Hill race was held in 1974, and was won by Paul Wilson of San Jose by a mere two inches over Craig Elliot of Los Altos. That first race was truly a sprinter's delight. The 1976 edition of Cat's Hill proved to be something else altogether, when Bill Robertson (Peninsula Velo) and David Perry (Palo Alto) surged ahead of the pack. At the finish, Robertson out-sprinted Perry by a bike length, and a minute later the pack sprinted for 3rd place. The 1977 Cat's Hill race for senior riders was one for both roadies and sprinters. One of the amazing stores to unfold that year concerned an incident involving Fred Markham (Los Gatos), 1976 Montreal Olympian. Almost halfway through the race, Fred's chain slipped off the sprockets as he was straining up Cat's Hill -- something that usually causes a crash! However, Fred showed his tremendous bike handling ability by executing a perfect U-turn on the hill, coasting down the hill while reaching down to put the wayward chain back in place. Without ever stopping, he made another U-turn and chased the pack furiously up the hill. A lap later, Markham caught the pack, and a lap after that he blew by the field to win a prime sprint. One unsuccessful breakaway attempt after another followed, until the young Marc Brandt (San Jose) jumped ahead. Much to the crowd's delight, Marc held his lead of one minute to finish alone. Finishing second was World Championship rider Mark Pringle (Seattle), followed by Fred Markham in third. The 1978 National Classic Cat's Hill truly lived up to its name. It was one of the great duels of all time, as National Senior Champion Wayne Stetina and Junior World Champion Greg LeMond broke away and tried to drop each other lap after lap. Early in the race, Wayne rolled a tire on Massol, forcing him to run up the hill, pushing his bike. He then borrowed a bike and chased for three excruciating laps before regaining the field. Not too much longer, Wayne and Greg were at the front of the field, and the the question grew in everyone's mind: Could the talented junior beat the accomplished senior? As they rounded the final corner, it was LeMond in front, and to the delight of the crowd he won the sprint handily. Greg lists this win as one of his most memorable. 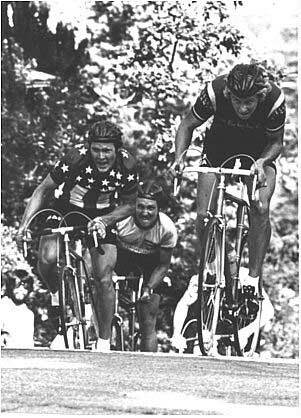 Greg LeMond (right) and Wayne Stetina (left) battle up Cat's Hill. The 1979 race turned into quite a show was former winner Marc Brandt, exhibiting incredible strength, broke and away, only to be caught and passed after having mechanical problems. He chased hard, and eventually caught a small group and placed third. Meanwhile, Bill Watkins (U.S. Army, Monterey) and Bob Muzzy (Berkeley) had jumped ahead of the field to fight for first place. The duel ensued as each rider attempted to lose the other. In an unexpectedly close finish, Muzzy edged Watkins by only 6 inches to take the win. The 1980 race was one of sweet revenge for Bill Watkins, who let it be known fairly early that he meant business. Mark Brandt had not turned his entry in on time, so he was unable to seek his own revenge. Watkins broke away approximately halfway through the event, establishing a sizable lead. Could he last, and would his luck hold out? (Two years before, he had run into a careless spectator who had darted out in front of him on the Bachman-Tait turn.) Instead of fading, he seemed to get stronger, and finished well ahead of the next group. Several riders had taken up the chase, and Jim Rodgers was the next to cross the line, with Gavin Chilcott taking third. In 1982's exciting race, attempts to get away from the field were reeled back in time and again. It looked as if the finish would be decided in a field sprint for the first time since the inaugural race in 1974. But to the delight of the hometown crowd, Chris Huber (Los Gatos) made his move with less than a lap to go, blasting away on the Nicholson Hill to finish more than 50 meters ahead of Calvin Trampleasure (Berkeley) as the field surged to the finish. In 1983, the race actually did come down to a field sprint. Fred Markham emerged the winner in the last few seconds of the race. Earlier in the day, Eric Heiden, Olympic skating champion and professional bike racer, placed well in the Santa Rosa Rock Hopper classic, then drove to Los Gatos and placed 5th in the 1/2 race. Now that's stamina! The Women's race in 1984 proved to be the most exciting of the day. Liz (Newberry) Chapman, suffered a mechanical failure and fell almost a lap behind the field. In an incredible show of determination, she chased down the field, came through, and won the race going away. 1985 was an interesting year in Northern California racing, as many of the premier racers went to the Tour of Baja stage race, where they contracted a form of valley fever. This particular form manifested itself as a type of bronchitis, causing breathing difficulties. Neal Stansbury, who had been in bed the week preceding Cat's Hill, participated while not fully recovered. Neal contested the race hotly, finishing second behind perennial favorite Fred Marham. Immediately at the conclusion, Neal collapsed and was taken from the scene having considerable difficulty breathing. The strain of the race had triggered a relapse, and he was unable to train for a week. The 1986 Pro-Am race included a number of nationally-known riders: Andy Paulin and Mark Caldwell (National Cycling Team), Chris Huber (Schwinn/IcyHot), and human powered vehicle World Record holder Fred Markham. Paulin arrived the day before the race from Poland, escaping the fallout from the Cherynobl disaster. The morning of the race itself saw rain, but the skies cleared, giving the Pro-Am riders nearly perfect racing conditions. The day's most interesting story was Mike Engleman himself. Mike had started racing the year before as a Category 4 rider. The 1986 Cat's Hill was the eleventh race of his career. He had upgraded to Category 3 with astonishing speed, thanks in part to his extraordinary aerobic capacity (honed by his training as a marathoner -- he finished 20th in the Boston Marathon), and his light weight, which contributed to his exceedingly strong climbing. He was at the front, in contention, for the entire race, until flatting on the last climb of the Hill. Both Mike and the disappointed crowed were denied a sprint finish against eventual winner Mark Caldwell. The 1987 Cat's Hill, held the year of the Town of Los Gatos' Centennial, brought forth the largest and most impressive collection of riders in the history of the race. The list of teams included nearly every major trade team in the sport: 7-Eleven, Alpha Romeo, Avocet, Celestial Seasonings, Weight Watchers, Lowenbrau, Lowrey's, Sundance/Fuji, ICN, IME-Bianchi, and Schwinn, as well as riders from the Netherlands, Belgium, France, Germany, Switzerland, The United Kingdom, Canada, and Japan. Both the men's and women's races were incredibly exciting. The strength of the women's pack was such that no clear leader emerged throughout the course of the 12 hard laps that they rode. Team tactics then took over, with Genny Brunet and Madonna Harris taking first and second, with Katrin Tobin (Lowrey's) a close third. The men's race was a shootout between Ron Kiefel of 7-Eleven and Alan McCormick of Schwinn-IcyHot. The two dueled against each other on every lap for the $150 King of the Hill prize, given to the rider who lead at the top of the Hill the most times. Leonard "Harvey" Nitz was close at hand until, in the last five laps of the race, his seat broke off, and he finished the race with no saddle all! Davis Phinney, odds-on favorite for winning the sprint, dropped his chain on the Hill twice, and was thus effectively eliminated. The end saw Kiefel out-power McCormick, and at some distance behind, Randy Whicker (Lowenbrau) led the pack to take third. In 1988, the women's and junior's races were dominated by national teams. The Plymouth-Reebok junior development team took five of the top eight places. Peggy Maas rode away from the pack early in the race. She soloed the last five laps, winning the lion's share of the $1000 purse in convincing fashion. The senior men's race was a tactical event, consisting of pack management and carefully-planned attacks, which in every case were covered. In the end, it came down to a field sprint. Matt Doval, a veteran of Northern California racing, came through with the aid of his teammates on Avocet/Miyata, Chris Wire (3rd), and Keith Vierra (4th). The 1989 Pro-Am event brought Chris Huber (who started racing with the LGBRC), Andy Paulin, Doug Shapiro, and Alan McCormick from the Coors Light squad to race the Cat's Hill. Huber, whose credits include nearly every large criterium, velodrome, and road event in Northern California. The internationally-rated team clearly dominated the field. Late in the race, Doug Shapiro's saddle broke off, but he continued for two full laps with only the seat post on his bike. In the end, the Coors Light squad formed a freight train at the front of the field and led Chris to the win by nearly ten seconds.